I have just received my Offer Letter from FCDA, can I get a loan? Yes, but only if you meet the requirements. 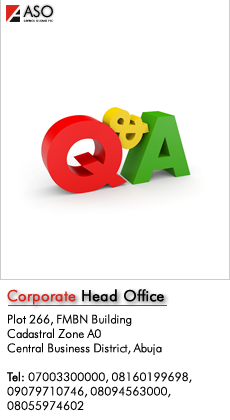 Please see any of our Customer Service Officers or your account officer for more details. FCDA has changed the value of my property upwards. Can I get an additional loan? Yes. But you will be required to pay 10% equity and 2% administrative fees. You will also be required to complete new application forms. I want to start a business. Can ASO Savings & Loans assist me with a mortgage? No. Mortgages are for Real Estate/Property only. If you wish to start or expand your business, please see either your Account Officer or any member of our Product & Market team (at any of our branches) who will be pleased to offer advice on ASOs Small Business Banking products. If you have any other enquiries regarding our services you could visit our website www.asoplc.com, call our Customer Care line (09-7041631121) or mail customerservice@asoplc.com. My house/allocation has been revoked by FCDA, what do I do? This is what in your Loan Agreement is called ‘Force Majeure’. Return of original documents received from you by the Bank i.e. original offer letter, receipt(s), etc. Please note that COT and the administrative fees are non-refundable. ASO has paid for my house, but I have not received the receipt of final payment. What do I do? Please request that one of our Customer Service Officers to do a manual check for your receipt. Once confirmed that your receipt has not been issued, ensure that your name and EOI number are taken and placed in our Unissued Receipt List. We shall forward it to the Head of Accounts, Ad-Hoc Committee on SOFGH, who will confirm to us if your document/payment is okay or not. If it is, we issue you a receipt within 2 weeks. But if not, they inform us of the outstanding requirements and we inform you via phone of the outcome. I would like to rent/let/lease my property, can I do this? No, you are not allowed to rent/let/lease your property without prior consent of the bank. If you intend to rent/let/lease your property, you should write to us indicating your intentions stating the rental period and amount. Should the information prove satisfactory, our Legal Team will give consent in writing to the rent/let/lease of the property. I would like to pay off/reduce my mortgage loan, can I do this? This is referred to as ‘Balloon Payment’. To do this, you should first deposit the amount you wish to pay into your loan current account. Then request for a ‘Balloon Payment Form’ from any of our Customer Service Officers who will be pleased to give you further information on processing your balloon payment (including the attendant charges). Once the “Balloon Payment’’ is done, you can collect your new repayment plan from your branch within 48hours of submitting your request. Alternatively contact your Account Officer to process this on your behalf. What types of mortgages are available at ASO Savings and Loans? Negotiable in line with market. Can I know my Mortgage Account Balance? See one of our Customer Service Officers or your account officer. May I get a loan to renovate my house? Can I get a mortgage before I find my property? You cannot get a mortgage loan without having a property that you can use as security for the loan. How do I pay back my mortgage? I am a Career Public Servant. Can I get a mortgage? All career public servants can make an application for a mortgage as long as they are in full time employment at the date of application. However you are required to make a payment of at least 25-30% on the property of your choice, and domicile your salary with ASO. What other costs will I incur in taking out a Mortgage? When you take out a mortgage, you should be aware that in addition, you will have to pay valuation and processing fees. Once you take ownership of the property, ASO will insist you take out insurance cover on the building. It is advisable to take out contents insurance as well. Always look at the total package and not just focus on the costs or interest rates. Is my Certificate of Occupancy with ASO? Please contact our Customer Service Officers who will check for you. What is the early repayment charge for my mortgage? Your Offer Letter and the terms and conditions contained therein highlight in detail the early repayment charge associated with your mortgage. Why is my interest payment higher than my principal payment? Your monthly repayment depends on the tenor of your loan and is calculated at a reducing annuity mortgage basis. The principal has to be spread over the period or duration of the loan. For example, if you a have N5millon loan for a tenor of 5years, the principal repayment has to be spread through 5 years. Therefore as you pay your principal (which makes up part of your monthly repayment) which has been spread, you reduce the interest paid on the loan. While your monthly repayment remains as stated in your offer letter, the components of this repayment (interest and principal) may be seen on your statement to vary. Your interest repayment on the onset is higher than the principal repayment, but tapers off (reduces) over time as you service your loan, while your principal repayment which starts off as lower than the interest repayment increases until it exceeds the interest portion of the repayment while the loan is being serviced. Why do I need to pay insurance premium quarterly? Any of our Customer Service Officers will be happy to answer any other questions you have regarding making an insurance claim. Is ASO a registered Mortgage Institution with the Federal Mortgage Bank? Yes, it was incorporated in November 1995 as a limited liablilty company. Is ASO one of the Mortgage Institutions licensed to participate in the National Housing Fund (NHF) operated by Federal Mortgage Bank of Nigeria (FMBN)? As stated above, ASO is a registered mortgage institution with FMBN and is licensed to participate in all mortgage schemes operated by FMBN, including the NHF. How long has ASO been into providing Mortgage services? What interest rates does ASO charge for its Mortgage facilities? For Commercial mortgages, interest rates are dependent on prevailing market rate. However tenors under this category typically range between 1 year to 5 years. Is there a specific tenure for the mortgage facilities offered by ASO? As discussed above, the tenure of mortgages depends on the mortgage scheme, and as determined by the Federal Mortgage Bank of Nigeria (FMBN). Must I have an account with ASO before I benefit from your Mortgage services? 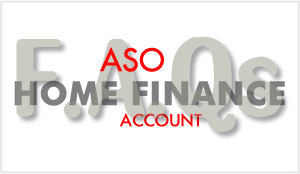 To enjoy ASOs mortgage services, you are required to have a current account with ASO to accommodate the mortgage. Must I operate my account for six months in ASO before I get a loan? To get a loan from ASO, you are required to have an operational account. However, you can still benefit from ASOs mortgage services even if you have not operated your account for up to six months. Can retired employees also benefit from your mortgage services? Retirees can also participate in all our mortgages services except the NHF Loans. As a client-focused institution, ASO caters for all class of customers including low income earners. However, this will depend on the value of their request. Has ASO successfully accessed the National Housing Fund on behalf of its customers? Is the NHF Loan for only contributors to the scheme? Yes. The NHF loan is for contributors who have made subscribtion to the Fund for a period of at least six months. For new subscribers that wish to benefit from the scheme, they can make the six month payment at once and continue subsequent monthly payments. At what interest rate does a Contributor access the NHF Loan through ASO? Eligible contributors can access the NHF loan at an interest rate of 6% per annum. Can the NHF loan have tenors that are more than 10 years? Yes. Subject to age and income of the contributor, the NHF loan can be accessed for a maximum period of 30 years. What makes a contributor eligible to access the NHF Loan? A contributor becomes eligible to access the NHF loan after making contributions for a minimum period of six months. Is there an age limit after which a customer becomes ineligible to benefit from the NHF Loan? Yes. The age limit is 60 years, which corresponds with the retirement age in the civil service. Can the NHF Loan be used to construct a new house? Yes, but you must have initially developed the house up to 30% completion stage. Can it be used for renovating an existing house? Yes, you can apply for the purpose of renovation, as long as you have a certified Bill Of Quantities (BOQ). Is there a maximum amount that can be accessed by Contributors? Under the NHF scheme, the maximum amount that can be accessed is N5mm. How long does it take for applications to be processed by FMBN? An average of 3 months, depending on the geographical location of property. Does a contributor apply for the NHF Loan before or after identifying a house? After identifying and being offered the house by the owner. What is the Sale Of Federal Government Houses (SOFGH) programme about? Its a pilot scheme where houses owned by the Federal Government are mortgaged at a regulated interest rate under specific defined underwriting conditions. The mortgages generated under this scheme will eventually be sold to investors in the capital market. What is involved in participating in the SOFGH programme? A Letter of offer for a Federal Government House from the Ad-Hoc committee FCT. Where do I get information on the Sale Of Federal Government Houses programme? Yes, prior to bidding or when an offer is made to the loan applicant. The loan applicant is required to make an equity contribution of 30% of the amount, and repayment of the 10% loan must be made within 90days of the offer. How do I know if I have won the bid for the house I have identified? What happens to my 10% bid amount when I lose the bid? Does ASO have influence in the Adhoc Committe on SOFGH that gives its customers an edge over other bidders? No. ASO does not have any sought of influence in the Adhoc Committee, however, ASO abides by the guidelines outlined by the Committee. Has ASO successfully assisted its customer to complete payments to the Adhoc Committee on Sale Of Federal Government Houses before? Yes, currently we have close to 6,000 customers benefiting from ASOs mortgage services. Can I apply to ASO for a loan after I have paid the initial 10%? Yes, as long as you have an offer from FCDA. Is the Sale Of Federal Government Houses programme open to all Nigerians? How long will it take to get my receipt to confirm that ASO has made payments to the Adhoc Committee on SOFGH on my behalf? Though this process is entirely beyond the control of ASO, it usually takes an average of 30 days. Will ASO assist its customers to take possession of occupied houses? The FCDA ensures that through its task-force. What are the documentation requirements for getting a mortgage facility from ASO under the SOFGH programme? What will be the impact of a bulk repayment on subsequent monthly payments? Bulk payments will deflate the monthly repayments or reduce the tenor of the loan, whichever the applicant prefers. When will the title documents to the house be transfered to me? All documents will be transferred to the customers upon making full payment of the mortgage loan to ASO. Does ASO provide other mortgage facilities that are not under the NHF and SOFGH schemes? Yes, ASO provides mortgage loans that are not under the NHF and SOFGH to its customers. At what rate does ASO provide the Commercial Mortgage Facility? ASOs CMF is offered to customers at the prevailing market rates. Is the Commercial Mortgage Facility for only houses? It can be used for shops, land and other real estate properties. Can the Commercial Mortgage Facility be for tenors of up to 10 years? No, the maximum tenor under the CMF is 5 years. Can I use the CMF to build a new house? Yes, you have to have developed the property to 30% completion stage. Can the CMF be used to renovate an existing house? Yes it can provided that there is a Bill Of Quantities (BOQ) for the renovation work to be carried out. Yes, CMF could be granted to enable the customer make payment for a property pending release of NHF loan. When the NHF loan is granted, the CMF could then be converted to the NHF loan. However all outstanding payments under the CMF must be paid notwithstanding the NHF loan. Can I use my shares to secure the CMF? Yes, normally, we will use the property being financed; shares come in as additional comfort. What other Collaterals can be used to secure the CMF? Ideally, the property being financed or alternative real property. Other forms of securities, such as shares of quoted companies, may be accepted. Is the CMF open to Civil servants? Yes, depends on the ability of the civil servant to pay back the loan. Must I have an account with ASO to benefit from the CMF? Yes you would have to open a current account with ASO. This is a system or process by which one party referred to as the insurer agrees to indemnify the other party called the insured in the event of any financial or material loss after due payment of a consideration called premium. A premium is the payment you make on the insurance policy payable annually. Premiums are calculated based on the property value, loan balance and age of the person who is insured by the policy and tenor of loan. The younger you are, the lower the premium. One of the most important reasons to purchase insurance is to ensure your loved ones are provided for financially. Mortgage Protection is useful in helping your survivors pay your mortgage debt after your death. General Protection is useful in helping to reinstate or replace property damaged or destroyed. Mortgage protection is a contract between the policy owner/insured and the insurer, where the insurer agrees to pay a sum of money upon the occurrence of the insured's death. In return, the policy owner agrees to pay a stipulated amount called a premium at regular intervals. This provides indemnity to the insured in the event of loss or damage to property covered under it as a direct result of fire outbreak, lightning or explosion. It is a contract wherein the insurer guarantees to pay for the loss and damage to the property for the specified period of time (normally the policy is a one year policy and renewable annually). How soon does the coverage start and how long does it cover for? Generally the coverage starts once premium is received by the insurance companies. The cover is usually for a year and premium is remitted annually. Will I get my certificate? A master policy will be provided by the insurance company. Individual certificates containing abridged policy information will also be provided, which will be electronically mailed to customers. What happens when the premium expires and no premium is paid? Annual premium is to be paid, in the event no premium is paid to the insurance companies; there is no cover for any event that happens within that period no premium was paid. Can I continue with the insurance premium after payoff of my loan with the bank? If yes to the above, what will be the new rate or will it be the same premium I pay now? In the event of loss of job or sickness and I am unable to pay my dues, will the Insurance pay my outstanding so that ASO doesn’t foreclose my property? There is no insurance cover in the event of loss of job or sickness. The insurance claim is only applicable in the event of the death of the customer and the death claim proceeds are used to clear up the customer’s outstanding loan amount with the bank. What will the Next Of Kin (N.O.K) of the deceased customer do in the event of death? The NOK should visit the bank within 90days of the incidence to formally notify ASO of the passing on of the mortgage beneficiary. A formatted ‘Death Notification & Insurance Claim template will be completed by the NOK with a copy of his/her valid ID card and the deceased death certificate as supporting documents. Subsequently, the Letter of Administration from Probate Registry of the Federal High Court should be applied for and obtained by the NOK to facilitate the process of releasing the original titles of the deceased estate from ASO. What happens if I do not report within the 90days window period in the event of an incident? The claim will not be accessible as it has exceeded the notification window period. The CBN’s action is geared to support its Cash Lite policy and improve customer confidence in the use of cheques as a medium of payment.